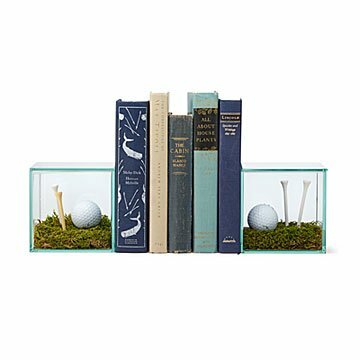 Fill these glass bookends with tiny treasures to keep on display along with your favorite stories. Certain bookworms don't just devour words, they keep beloved stories displayed for all to see. These transparent boxes let book lovers place their favorite tales between special keepsakes. Made of crystalline glass panes sealed with watertight glue, each bookend is basically a tiny trophy case, ready to show off its treasures. Fill it with with anything that strikes your fancy: Found seashells to frame your Hans Christian Andersen collection. Model spaceships alongside sci-fi novels. As in a well-written book, the possibilities are endless. Made in China.